Narco News Publisher’s Note: Catherine Austin Fitts is a former managing director and member of the board of directors of Dillon Read & Co, Inc, a former Assistant Secretary of Housing-Federal Housing Commissioner in the first Bush Administration, and the former President of The Hamilton Securities Group, Inc. She is the President of Solari, Inc, an investment advisory firm. Solari provides risk management services to investors through Sanders Research Associates in London. When I was a child growing up in the 1950’s at 48th and Larchwood in West Philadelphia, the Solari Index was 100 percent. It was unthinkable that a child was not safe running up to the stores on Spruce Street for a popsicle and some pin ball. The Dow Jones was about 500, the Solari Index was 100 percent and our debt per person was very low. Of course I did not think about it that way at the time. All I knew was that life on the street with my buddies was sweet. Today, the Dow Jones is over 9,000, debt per person is over $100,000 and my favorite hairdresser in Philadelphia, Al at the Hair Hut in West Philadelphia, and I just had a debate yesterday afternoon while Al was cutting my hair about whether the Solari Index in my old neighborhood was 0 percent (my position) or 10 percent (Al’s position). Men always think it is higher than women. Despite the boy-girl spread between us, it is fair to say that Al and I agree that the Solari Index is in the tank — both in the streets of Philadelphia and throughout America. Life on the street ain’t sweet any more. I watched the slide of the Solari Index as a child. A lot of it had to do with narcotics trafficking and the people that narco dollars put in power on our streets — and in city hall, in the banks, in Congress and the corporations and investors down town and that ring the city. That’s when I decided that I would have to learn how the money works on the drug trade. Here is what I have learned that has been useful to me — and may help you have a better map of how narco dollars impact you, your business, your family and the Solari Index in your neighborhood. Okay, let’s start at ground zero. It is 1947, and World War II is over. America is ready to go back to work to build the corporate economy. We are in New Orleans on the docks. Ok, so let’s say that Sam sells his entire boatload of sugar to the sugar wholesaler on the docks for X dollars. Now, after Sam pays his workers and all his costs of growing and transporting the sugar, and after he and his wife spend the weekend in New Orleans and he pays himself a bonus and buys some new harvest equipment and pays his taxes, how much cash does he have left to deposit into his bank account? Or, another way of saying this is: What is Sam’s net cash margin on his sugar business? Well, it depends on how lucky and hard working and smart Sam is, but let’s say that Sam has worked his proverbial you know what off and he makes around 5-10 percent. Sam the sugar man has a 5-10 percent cash profit margin. Let’s call Sam’s margin S for slim or SLIM PERCENTAGE. Back on the docks, the second boat — an exact replica of the boat carrying Sam’s sugar — is a boat carrying Dave’s white agricultural product called drugs. In those days this was more likely to be heroin, these days more likely to be cocaine. Whatever the precise species, the planting, harvesting and production of this white agricultural substance, Dave’s drugs, are remarkably like Sam’s sugar. Ok, so if Sam the sugar man sold his sugar to the sugar wholesaler for X dollars, how much will Dave the drug man sell his drugs to the drug wholesaler for? Well, where Sam is getting pennies, Dave is getting bills. If Sam had sales of X dollars, let say that Dave had sales of 50-100 times X. Dave may carry the same amount of white stuff in a boat but from a financial point of view, Dave the drug man has a lot more “sales per boat” than Sam the sugar man. Now, after Dave pays his workers and all his costs of growing and transporting the drugs, and after he and his wife spend the weekend in New Orleans and he pays himself a bonus and buys some new harvest and radar equipment and spends what he needs on bribes and bonuses to a few enforcement and intelligence operatives and retainers to his several law firms, how much cash does he have left to deposit into his bank account? Or, another way of saying this is what is Dave’s net cash margin on his drug business? Don’t listen to me. And don’t listen to Peter Jennings, Dan Rather or Tom Brokaw. Who do you think pays their salaries? Who owns the companies they work for? Sam or Dave? Don’t listen to anyone else. Think about the numbers and listen to your heart. What do you believe? It’s more than fifty years now since the boats transporting Sam and Dave’s white agricultural products docked in New Orleans. I don’t know what the Narco National Product (Solari’s term for that portion of the GNP coming from narco dollars) was in 1947, but lets say it was a billion dollars or less. Today, the Narco National Product that number is estimated to be about $400 billion globally and about $150 billion plus in the United States. It helps to look at the business globally as the United States is the world leader in global money laundering. According to the Department of Justice, the US launders between $500 billion — $1 trillion annually. I have little idea what percentage of that is narco dollars, but it is probably safe to assume that at least $100-200 billion relates to US drug import-exports and retail trade. Ok, so let’s think about how much Sam and Dave have in accumulated profits in their bank and brokerage accounts. Let’s assume that the US narco national product in 1947 was $1 billion and it has grown to about $150 billion today. Assume a straight line of growth from $1 billion – $150 billion, so the business grows about $3 billion a year and then tops out at $150 billion as the Solari Index has bottomed out at or near 0 percent. America is about as stoned on illegal drugs as it can get, and growth in controlled “Schedule II” substances has moved to Ritalin and other cocaine-like drugs for kids that government programs and health insurance will now finance. Let’s take the BIG PERCENT margin that we estimated for Dave the drug man’s net cash margin. Let’s say that every year from 1947 through 2001, that the cash flow sales available for reinvestment from drug profits grew by $3 billion a year, throwing off that number times BIG PERCENT. Okay, assume that the reinvested profit grew at the compound growth rate of the Standard & Poor’s 500 as it got reinvested along the way. My numbers showed that Dave the drug man had bought up not only Sam’s companies, but — if you throw in other organized crime cash flows — a controlling position in about most everything on the New York Stock Exchange. When you think about it, this analysis make sense. The folks with the BIG PERCENT — big cash margin — would end up rich and in power and the guys working their you-know-what off for SLIM PERCENT — a low cash margin — would end up working for them. Lest you think my comment about the New York Stock Exchange is too strong, let’s look at one event that occurred before our “war on drugs” went into high gear through Plan Colombia, banging heads over narco dollar market share in Latin America. 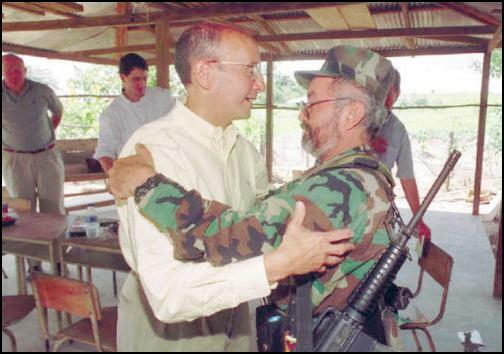 In late June 1999, numerous news services, including Associated Press, reported that Richard Grasso, Chairman of the New York Stock Exchange flew to Colombia to meet with a spokesperson for Raul Reyes of the Revolutionary Armed Forces of Columbia (FARC), the supposed “narco terrorists” with whom we are now at war. The purpose of the trip was “to bring a message of cooperation from U.S. financial services” and to discuss foreign investment and the future role of U.S. businesses in Colombia. Some reading in between the lines said to me that Grasso’s mission related to the continued circulation of cocaine capital through the US financial system. FARC, the Colombian rebels, were circulating their profits back into local development without the assistance of the American banking and investment system. Worse yet for the outlook for the US stock market’s strength from $500 billion — $1 trillion in annual money laundering — FARC was calling for the decriminalization of cocaine. To understand the threat of decriminalization of the drug trade, just go back to your Sam and Dave estimate and recalculate the numbers given what decriminalization does to drive BIG PERCENT back to SLIM PERCENT and what that means to Wall Street and Washington’s cash flows. No narco dollars, no reinvestment into the stock markets, no campaign contributions. I deduced from this incident that the liquidity of the NY Stock Exchange was sufficiently dependent on high margin cocaine profits (BIG PERCENT) that the Chairman of the New York Stock Exchange was willing for Associated Press to acknowledge he is making “cold calls” in rebel controlled peace zones in Colombian villages. “Cold calls” is what we used to call new business visits we would pay to people we had not yet done business with when I was on Wall Street. I presume Grasso’s trip was not successful in turning the cash flow tide. Hence, Plan Colombia is proceeding apace to try to move narco deposits out of FARC’s control and back to the control of our traditional allies and, even if that does not work, to move Citibank’s market share and that of the other large US banks and financial institutions steadily up in Latin America. It makes sense. Those are the biggest states. They have big coastal areas and borders and big ports. It would make sense that the population would grow in the big states where the trade and business flow grows. If you check back to Part I of “Narco Dollars for Dummies”, we described two businesses. One was Sam’s sugar business that had a SLIM PERCENTAGE profit. The other was Dave’s drug business that had a BIG PERCENTAGE profit. It would make sense that these four states would be real big in both Sam’s sugar business and Dave’s drug businesses. What’s next? What are the four states with the biggest business in taking the laundered narco profits and using them to deposit money in a bank, or to buy another company, or to start a new company, or just buy stock in the stock market? That’s what I call the reinvestment business. Well, let’s see. Jeb Bush was the governor of Florida. Governor Jeb was the son of George H. W. Bush, the former head of an oil company in Texas and Mexico and the former head of the CIA and the former head of the various drug enforcement efforts as Vice President and President. Then George W. Bush, also the son of George H. W. Bush, was the governor of Texas. So the governors of two of the largest narco dollar market share states just happen to be the sons of the former chief of the secret police. Will Smith plays a successful Washington lawyer who is targeted in a phony frame and smear by a US intelligence agency. The spooky types have high-speed access to every last piece of data on the information highway — from Will’s bank account to his telephone conversations — and the wherewithal to engineer a smear campaign through the papers and the Council on Foreign Relations types. According to the CIA, we were paying our government to help the narco dollars make money in a way that — if you read Community Wizard’s comic book-like money maps — was losing taxpayers and homeowners billions of dollars. The places were chosen to move me as far away as possible from the corridors of power in Washington and on Wall Street filled with people benefiting from narco dollars and their reinvestment. That strategy-combined with excellent legal and administrative work by a first rate team of very courageous people — has been successful in besting the targeting. It made it possible for me to understand how our economic addiction to narco dollars worked and how to it was draining our neighborhoods. I teamed up with the members of my family and friends and their neighbors who were getting drained. One of my new homes is in the city in Philadelphia, near where I grew up in West Philadelphia. Another is in a very beautiful and close knit farming community in Hickory Valley, Tennessee where my father’s family has lived since the 1850’s. One day, Forest, my dog, and I were up in Georgie’s apartment to enjoy a fresh plate of scrapple that Georgie had fried up that morning. The conversation turned to narco dollars. Georgie said that looking at the big picture was simply too overwhelming. Couldn’t I explain this without using the words millions or billions — just dollars and cents in terms of our neighborhood in West Philadelphia? I always have this problem explaining international money flows to moms and grandmoms. Most really great women want to know about the real world. The world of real people — her world full of her kids and grandkids and other kids she loves. As described in Part I, the Solari Index is my way of estimating how well a place is doing. It is based upon the percentage of people in a place who believe that a child can leave their home and go to the nearest place to buy a Popsicle and come home alone safely. The Solari Index is about how safe you feel you and your neighbor’s kids are. When I was a child growing up in the 1950’s at 48th and Larchwood in West Philadelphia, the Solari Index was 100 percent. It was unthinkable that a child was not safe running up to the stores on Spruce Street for a Popsicle and some pinball. The Dow Jones was about 500, the Solari Index was 100 percent and our debt per person was very low. Of course I did not think about it that way at the time. All I knew was that life on the street with my buddies was sweet. Life on the street ain’t sweet anymore. So in the case of PepsiCo described above, if the management increases soda pop sales in a way that net income goes up by $100,000, the stock goes up $2 million. Now let’s say, the board and management do a whole series of things to attract new investors and improve the company’s image and, as a result, the stock starts trading at 22 times profits. Then, the stock value goes up even more. Whether increasing net income or increasing the multiple at which the stock market values the company profits, the board and the management are focused on making the stock go up. That is how their money works. OK, now what does this all mean for the Solari Index in Philadelphia? If I am a group of mothers in my neighborhood who want the Solari Index to go back up to a 100%, what’s stopping me? Assuming a 20% margin for the BIG PERCENTAGE profits and a 20 times multiple on the stock of the companies that Dave and his investors and banking partners were using to launder the money, let’s look at how much of the stock market value would be “addicted” to the drug and money laundering profits flowing through the Philadelphia area. Imagine what happens to your stock multiple if you are a Philadelphia corporate chieftain and you don’t run narco dollars or large purchases fueled by narco dollars through your financial statements and you don’t attract narco dollars to reinvest in your stock? What happens to your corporate income and your stock profit if the ones who invest narco dollars — accumulated over the last fifty years compounding at their magical compound interest — don’t like you? How is everyone in Philadelphia who loses money on your stock going down going to feel about you? The Department of Justice says that we launder $500 billion – $1 trillion. Multiply those times a BIG PERCENTAGE cash flow profit margin. Now figure how much of that “income” gets run through the income statement of publicly traded banks and companies and multiply that number by the multiple of income at which their stocks trade. After I finished Black Money I started to pay attention to “how the money works” at the fast food and motel franchises at every interstate exit between Tennessee and Philadelphia. What I noticed about them was that no matter when I drove by — day or night, weekday or weekend — some of them were suprisingly empty. Indeed, one or two name brands were defined by their perpetual emptiness. Conversations every time I stopped filled in a lot here and there about how much cash was coming in and going out on the food and retail business. Some quick estimation on what was being spent per interstate exit to start up and operate all the retail establishments versus what was coming in the door in terms of legitimate business said that some businesses had to be an excuse, an excuse to generate stock market capital gains by combining laundered money or phony profits with retail franchises — or both. Another quick and dirty estimation technique for your neighborhood is to take the Department of Justice’s figure of $500 billion – $1 trillion and divide by 281 million Americans for a “per American” estimate of money laundering market share. Now multiply that times the number of people in your area. Now divide by the number of local banks. What do the numbers say to you? The next time you are out on the streets, see if you can guess where the money is. It’s bound to be there someplace. Every year since I was a child the Solari Index goes down and the budgets that I pay for as a taxpayer to fund more enforcement, prosecution and incarceration go up. If you look at what taxpayers are paying, you would think we were picking up all the narco dollar industry’s expenses. The CIA, also not a reliable source, backs up Mr. Gotti’s postion. According to the CIA’s own Inspector General, the government has been facilitating drug trafficking. Indeed, according to the CIA and DOJ (Dept. of Justice), the CIA and DOJ created a memorandum of understanding that permitted the CIA to help its allies and assets to traffic in drugs and not have to report it. The best example I know is my own case. My estimate is that the federal enforcement establishment may have spent more to target me over the last six years than they spent to get Bin Laden before September 11. They clearly were not hampered in my case by having to respect the spirit or the letter of the law. I deduce from that only that the Solari model is not as good for the narco dollar and money laundering businesses as Bin Laden was — at least until recently. One of challenges of doing the numbers on the narcotics business is that narcotics are not always a commodity — sometimes narcotics are a currency used to pay for other things. A case in point is the Iran-Contra operation at Mena, Arkansas. It has been alleged that Oliver North and the White House (National Security Council) were dealing drugs through Mena not to make money, but to facilitate arms shipments. Mena has received attention as a result of its alleged financial contribution to Bill and Hillary Clinton’s rise to national prominence. You also see the arms-drugs relationship as you estimate how the money works on the private profits from various taxpayer funded wars. Vietnam, Kosovo, Plan Colombia, Afghanistan, what do they all have in common? Drugs, oil and gas, arms. Add gold, currency and bank market share and you have the top of my checklist for understanding how the money works on any war or “low intensity conflict” around the globe. If you trace back the history of the family and family networks of America’s leaders and numerous other leaders around the world, what you will find is that narcotics and arms trafficking are a multigenerational theme that has criss-crossed through Asia, North America, Europe, Latin America and Eurasia and back through the City of London and Wall Street to the great pools of financial capital. Many a great American and British fortune got going in the Chinese opium trade. It’s 1947. You want to make sure that America wins in the great game of globalization. The winner will be the country that accumulates the largest pool of capital to finance its corporations and investment in new technology. That is a problem because Americans vote for leaders who help them spend, not save. No matter how hard Sam the sugar man works and no matter how much he saves, how much capital can be pooled at SLIM PERCENTAGE? It is fair to say it is not enough to beat the investment network that can pool capital at BIG PRECENTAGE growth rates. (See Part I for the story of Sam and Dave). After taxation, organized crime is a society’s way of forming lots of pools of low cost cash capital. Organized crime is a banking and venture capital business. So the reality is that if you want to control the cash flow and capital that controls the overworld, you’ve got to control the cash flows getting generated by the underworld. Indeed, you’ve got to have an underworld. If it does not exist, you need to outlaw some things to get one going. It’s the power of compound interest. It’s 1947. If you don’t do it, you will be the loser. What would you do? The Sam and Dave dilemma of “to deal or not to deal” is made worse by the power of popular opinion. Last summer, I made a presentation called “How the Money Works on Organized Crime” to a wonderful group of about 100 people at an annual conference for a spiritually focused foundation in Philadelphia. This is a group of people who are committed to contributing to the spiritual evolution of our culture. After walking through the various Sam and Dave dilemmas with Sam’s SLIM PERCENTAGE profits sugar business and Dave’s BIG PERCENTAGE profits drug business, as well as the intersection between the stock market and campaign fundraising and narco dollars for about an hour, I asked the group what would happen to the stock market if we decriminalized or legalized drugs? They said, yes, that’s right. It’s August 1996. Gary Webb has just broken the story in the San Jose Mercury News about the CIA helping to deal drugs into South Central LA. He has put the legal documents up on their website. The proof is hard. The government is dealing drugs. Catherine Austin Fitts’s company is publishing a tool on the web called Community Wizard that shows maps with Geographic Information Systems software that include patterns of defaults on HUD mortgages in the areas of LA with the heaviest concentration of CIA supported Iran Contra drug trafficking. Which will it be in an election year? Will you do everything you can do to attract the reinvestment of the narco dollars into your campaign and into the stock market or will you let Fitts and Webb continue to illuminate “how the money works” on narco dollars in a way that might crash the stock market and make it harder and more expensive for the government to finance the deficit? In 1999, I was at a revival for Christian women. One of the presidential candidates made a guest appearance. A friend of mine, an Afro-American minister, who used to work for the Drug Enforcement Agency (DEA), leapt to her feet to applaud him with tremendous enthusiasm. I was surprised at her response given that she understood his success in attracting narco dollars not to mention his and his colleague’s silence on Gary Webb’s Dark Alliance reports and the subsequent CIA admission of drug dealing by the government. Not such an easy decision to vote for the “rule of law” is it? Indeed, Webb got fired and Fitts’ was targeted and, after spending $6 million on legal and related expenses, my fortune sank down to the same 0% as the Solari Index. But whatever I do, I can’t blame it just on the top guys. Whatever they did, whoever it was, they were doing what it took to please and win the crowd. The good news on all of this is that there are solutions. New technology blesses us with the potential tools we can use to radically increase productivity in a way that can “jump the curve” on our narco dollar addiction. Will it happen? I don’t know. My pastor says, “If we can face it, God can fix it.” The question is can we face our addiction to narco dollars? Can we do it in a way that entrepreneurs like me can build successful businesses and transactions that profit from getting the Solari Index and the Dow Jones Index to go up together? Sound impossible? Far from it. It’s quite possible. Add up all the current income generated by small businesses in America. It is currently valued at a multiple of 1-5 times because it is private-not publicly traded in a liquid stock market. Investors have no way to invest in a liquid publicly traded stock. The creation of a solari, a local knowledge manager/databank that publishes neighborhood financial statements and information and tracks the Solari Index in your place, can make it possible for your neighborhood to create a mutual fund that could channel capital to the profitable small businesses in your neighborhood so that participating small business income could start to trade at a multiple of 10 times — even 20 times or 30 times eventually. The potential capital gains are in the trillions of dollars. That is a lot of low cost capital that local entrepreneurs can use to create jobs and to build their businesses — even start new ones. Better yet, while your doing that how about reengineering billions of federal, state and local government investment that has a negative return on investment to both taxpayers and communities to a positive return on investment. More big capital gains that can be securitized and traded in a liquid stock market — again the potential profits are in the trillions. Finally, add up the value of all the homes and real estate in your community. OK, what would happen to the value of that equity if the Solari Index went back up to 100 percent? Real estate financed through a local trust or REIT or mutual fund that could be traded in the stock market would create a way for investors to start to “trade places.” That means they would profit from the Solari Index going up along with local real estate owners, homeowners and small business folks. Add some more trillions to the potential capital gains. That is why all the yah-yah in Washington about new stricter money laundering laws to deal with terrorism won’t work. If government officials and bankers can keep making money when the Solari Index is at 0%, it will not rise no matter how many people — innocent or guilty — we put in jail. The day we decide that government officials only make money for performance and all the companies that get money from government — whether contractors or banks that use taxpayers credit — only get money if we are better off and the Solari Index is rising, is when we will start to face and solve the real problems in a money making way. It’s time to face our addiction to narco dollars and to grapple with how to reverse our incentive systems. It is time to figure out how publicly traded companies and our banks and insurance companies can make more money from our kids succeeding then from them failing. Indeed, it can be done. Wouldn’t you pay for streets to be sweet for your child once again? Especially if it made you a whole bunch of money on an IPO of your neighborhood mutual or venture fund in the stock market? After three years of plowing through hundreds of books, videos and articles, here are the sources that I found most useful to helping me understand “how the money works” in the drug trade. Assuming that you are a busy person who knows nothing about narco dollars and does not want to become an expert — you just want to have a good map of “how the money works” in your world — I have put an (*) next to my top four book and one video recommendations. These are the ones that will be the most useful to help you understand the drug trade and what it means to you, your family, your business and the Solari Index in your neighborhood. False Profits: The Inside Story of BCCI, the World’s Most Corrupt Financial Empire, Peter Truell & Larry Gurwin. Boston: Houghton Mifflin Company, 1992. “Albert Vincent Carone: The Missing Link Between Iran-Contra Cocaine Operations and Organized Crime”, Mike Ruppert. From the Wilderness Publications, 1994.